Here’s how you can make and receive Skype calls from Asterisk without purchasing Skype for Asterisk from Digium. We’ll use stsProxy and SipToSis. 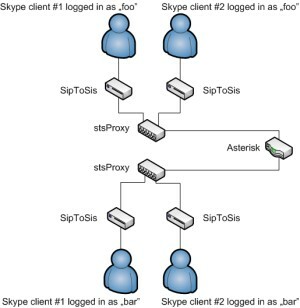 The main benefits of this method is that you can access Skype as a normal user, you don’t have to create a business user for the SIP interface needed by Asterisk, and you can have as many Skype “channels”, as you want, for free. 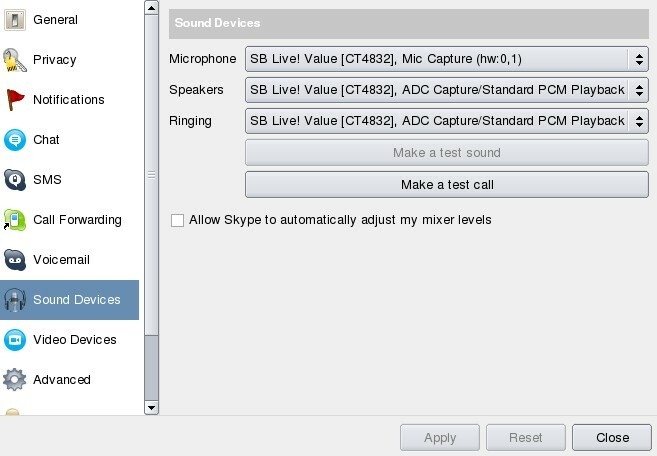 You’ll need at least one sound card in your computer running Skype instances. No analog inputs/outputs are needed, it’s just used by Skype. You could also try ALSA module snd-dummy, but users reported problems with it. You’ll need Sun’s Java JRE (aptitude install sun-java6-jre). OpenJDK is not suitable. Install Xvfb and x11vnc too (this means NO X desktop is needed for this solution). This way if you first press number 7 on your phone, then the phone number, the number will be dialed using Skype client “foo”. If you first press number 8 on your phone, “bar” will be used for the call. Next step: create a home directory for each Skype channel with adduser. You don’t have to give a password for these accounts since we won’t log in to them. So create four users: foo, foo2, bar, bar2 with home directories /home/foo, /home/foo2, /home/bar, /home/bar2. Setting up stsProxy: download and extract stsProxy to /home/foo/stsproxy and /home/bar/stsproxy (we need only one instance of stsProxy per Skype user, so you have to extract stsProxy to 2 separate dirs). Run “chmod +x stsProxy_linux” to make stsProxy’s startup script executable, and edit stsProxy.cfg. Set publicIP to your machine’s public IP (for ex. 192.168.1.1, if you are running stsProxy and Asterisk on the same localnet, also you can disable STUN, stunTestInterval=0), set via_addr to you Asterisk server’s IP. For user “foo”, set host_port=5065, from_url=”Foo” <sip:foo@ASTERISKSERVERIP:5060>, username=foo, passwd=foo, for user “bar”, set host_port=5066, from_url=”Bar” <sip:bar@ASTERISKSERVERIP:5060>, username=bar, passwd=bar. Replace ASTERISKSERVERIP with your Asteisk server’s IP address. Setting up SipToSis: download and extract SipToSis to each home folder (/home/foo/siptosis, /home/foo2/siptosis, /home/bar/siptosis, /home/bar2/siptosis). Run “chmod +x SipToSis_linux” in each folder to make SipToSis’s startup script executable. Edit SkypeToSipAuth.props, comment out the last line “*,play:clips/invalidDest.wav”. 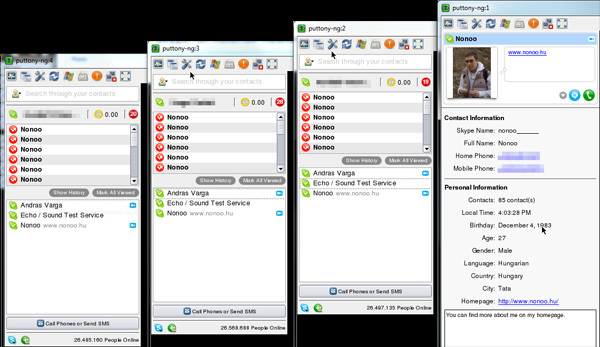 These settings will route the calls coming from the associated Skype client to the channel’s stsProxy. Don’t forget to uncomment sample auto config with no registration! That’s all for siptosis for now. Let’s see Skype. You’ll need the static version of Skype. Download an extract it to /usr/local/skype. This file contains the start/stop scripts for the individual users, extract them to your home dir. There’s also a script file called looper, which you have to place in /usr/local/bin. This script makes sure Skype is restarted when it unexpectedly exists. update-rc.d skypetrunk start 90 2 3 4 5 . stop 15 0 1 6 . ALSA interface for speakers and ringing are both set to hw:0,0 (mic is hw:0,1). You may want to add the log files to logrotate. Place and edit this file in /etc/logrotate.d/. You can find more info about SipToSis and stsProxy here. I had a strange problem with stsProxy, it always registered in Asterisk with my WAN IP address, even though it runs on the same server as Asterisk (IP: 192.168.1.1) and I couldn’t make Skype calls. Solution: set via_addr to 127.0.0.1 or the host name of the server.